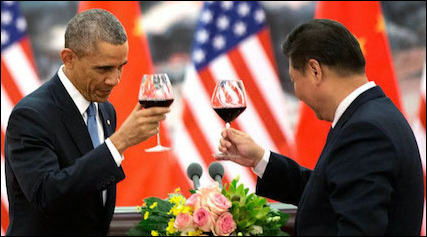 U.S. president Barack Obama (left) toasts Chinese president Xi Jinping, November 2014. While it makes immense strategic sense for Washington to pay greater attention to Beijing considering the rise in its economic power and military capacity, the "pivot to Asia" remains primarily a slogan with little policy follow-through. Cuts in defense expenditures hardly support the goal of containing China while at the same time leaving fewer military assets available for projecting power in the Middle East. The United States is in retreat in the Middle East, and the adverse implications of this policy shift are manifold. These range from acceleration of Tehran's drive to regional hegemony; to the spread of jihadist Islam; to the palpable risk of regional nuclear proliferation following the July 2015 Iran nuclear deal (Joint Comprehensive Plan of Action, JCPOA); to Russia's growing penetration of the region; to the possible satellization of the Persian Gulf and the Caspian basin by a resurgent Iran. The manifest U.S. weakness is also bound to have ripple effects far beyond the Middle East as more and more global players question the value of a partnership with a vacillating and feckless Washington. From his early days in power, President Barack Obama has pursued a grand strategy of retrenchment based on the belief that the Bush administration's interventionist policies had severely damaged U.S. standing and that a very different strategy was required: a non-aggressive, multilateral, and noninterventionist approach. This has resulted in the erosion of U.S. clout in several regions, notably Eastern Europe, the Far East, and the Middle East. Most unambiguous was Obama's intent to reduce the U.S. presence in the Middle East, and the rationale for this policy shift is clear: The region is among the world's most volatile areas with anti-U.S. sentiments particularly rampant. U.S. forces had fought two costly wars there in the past decade, in Afghanistan and in Iraq, in an attempt to prevent these states from becoming hotbeds of terrorism and to promote their democratization, only to be taught a painful lesson about the limits of power and the need for greater foreign policy realism. As Washington's deficiency in political engineering in the Middle East became clearer, overseas interventions became less popular at home. This evolution in domestic attitudes facilitated Obama's strategic shift. The desire for a lower profile in the Middle East was not the only factor behind Washington's retreat from the region. Dependence on energy resources from the Persian Gulf has been reduced, thanks to new technologies that can extract natural gas and oil within the continental United States. The country has, in fact, become an influential producer in the global energy market and is heading toward energy independence. According to an Energy Department report, even with low prices, U.S crude oil production was expected to hit a new record in 2015. Under these new circumstances, the Middle East appears less directly relevant to U.S. interests. However, in the long run, this perspective might prove short-sighted as the decline in energy dependency could be temporary. The preference to downgrade U.S. involvement in the Middle East was reinforced by Washington's pronounced decision to "pivot" toward China, an emerging global challenger. While Asia has always been important for the United States, Obama emphasized that his administration would no longer be diverted by secondary arenas such as the Middle East and would instead elevate Asia to top priority. Despite such declarations, however, "pivoting to China" remains primarily a slogan with little policy content, only underscoring Washington's inaction and weakness. As a result of this re-prioritization, the Obama administration has reduced military assets available for projecting power in the Middle East. To take one example, there was a recent period during which there were no aircraft carriers in either the eastern Mediterranean or the Gulf—an unprecedented situation since October 2015. And while officials within the Navy continue to recognize the need for a permanent aircraft carrier presence in the gulf or in its vicinity, the department is going ahead with plans for longer periods during which there will be no carriers in the area at all. A U.S. spokesperson has said that the reduced presence is due, not to lack of need, but to the availability of fewer carriers and the prioritization of the Asia-Pacific. Obama's policies were viewed as projecting a lack of understanding of Middle Eastern politics. As President Obama's reluctance to act in the Middle East became clearer, his policies were often viewed within the region as unwise, projecting both weakness and a lack of understanding of Middle Eastern politics. One early example was the administration's initial inclination to try to engage foes, such as Iran or Syria. Other defining moments were the passive approach toward the mass protests against the rigged June 2009 Iranian presidential elections; the desertion of long-time ally Hosni Mubarak of Egypt in February 2011; the "leading from behind" strategy in the Western intervention in Libya in March-October 2011, and the retreat from threats to use force against Syrian president Bashar al-Assad for crossing a chemical weapons "red line" that Obama himself had promulgated in August 2012. These decisions contributed to widespread perceptions, both in the Middle East and beyond, that Obama is a weak, unreliable ally with a questionable grasp of regional realities. The campaign against ISIS (Islamic State of Iraq and ash-Sha'm [Greater Syria]) provides additional evidence of the retreat of U.S. power in the Middle East. In August 2014, after a long and confused decision-making process, Washington concluded that ISIS's land conquests were evolving into a significant threat to U.S. interests and ordered its air force to attack ISIS installations and forces in Syria and Iraq. By the summer of 2015, the territory in those areas under ISIS control had indeed shrunk, but ISIS had made gains elsewhere. Unfortunately, the gap between the administration's goals and its willingness to allow its troops to pursue them on the ground has only bolstered ISIS's dual message about the weakness of the decadent West and the group's ability to withstand military pressure. The campaign also illuminated the daunting political and logistical challenges involved in organizing proxies to fight ISIS. Washington wants to transform ISIS into a manageable problem rather than vanquish it. While Washington remains reluctant to reinsert ground forces, it still hopes to reduce ISIS's potency. The expectation is that a protracted air campaign, accompanied by special operations, will break the group's momentum while buying time for local forces to organize and then to conduct ground operations. Washington wants thus to transform ISIS into a manageable problem rather than build a coalition to vanquish it and hopes to place the onus for ground fighting and the ultimate defeat of the group on the actors directly affected. The problem with this approach is that while the administration wants the Arab states to fight ISIS, these states want Washington to do the job for them. The administration has failed to induce local actors to cooperate effectively against ISIS, and the limited air campaign appears insufficient. Nevertheless, the administration continues to express its commitment to a war on ISIS. This is partly because a high threat perception helps legitimize its nuclear deal with the Islamist regime in Tehran. In effect, the administration is telling its critics that Tehran is a legitimate partner in defeating ISIS since it too views the extremist Sunni group as a threat. The Russian intervention in Syria, which began at the end of September 2015, has similarly underscored the U.S. weakness. In typical fashion, Obama issued dismissive statements on Russia's involvement and called the intervention a likely quagmire for Russian forces thereby absolving himself of the need to do anything. He did not specify how he would respond to Russian aircraft targeting U.S.-supported rebel factions but underlined that Washington would not directly confront Moscow. The tacit expectation that Syria would turn into a replay of the previous Afghanistan experience for Russia has proved to be unfounded. Putin's intervention, limited in scope and with no ground component, helped Assad consolidate his grip on some parts of Syria, particularly on the Mediterranean littoral where Russian bases are located. The tepid U.S. reaction to Turkey's November 2015 downing of a Russian Su-24M aircraft also highlighted the administration's over-whelming desire to avoid escalation. 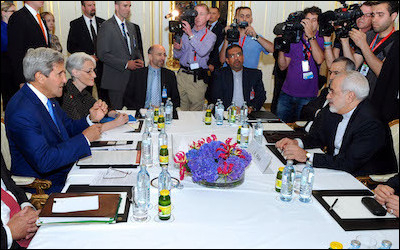 While U.S. secretary of state John Kerry (left), his European counterparts, and Iranian foreign minister Mohammed Javad Zarif (right) were delighted to conclude the Joint Comprehensive Plan of Action in Vienna, July 14,2014, U.S. allies in the region were alarmed at what they perceived as their abandonment. The "Iran deal" ignores the fundamental national security interests of Israel, Egypt, the Gulf states, and Saudi Arabia. Above all, Washington has desisted from confronting Iran on its nuclear program, instead going to great lengths to ac-accommodate it. President Obama proudly contends that by concluding the July 2015 nuclear deal with Tehran, he has resolved one of the outstanding security risks in the region before leaving office. In fact, the deal legitimizes a large nuclear infrastructure in Iran, leaves it with the ability to produce nuclear weapons within a relatively short time, and ignores the fundamental national security interests of at least two key U.S. allies: Israel and Saudi Arabia. The subsequent removal of international economic sanctions—with no reciprocal requirement for any change in Iranian regional policy—positions Tehran to reap great financial benefits at no cost. Since the conclusion of the deal, Iran has deliberately put the United States, the U.N. Security Council, and the European Union to the test by firing off long-range ballistic missiles. Even if the development of its nuclear program has been postponed by the deal, Tehran is doing what it can to ensure that it will be able to deliver a nuclear warhead once the stipulated fifteen-year delay is up. It is also using these missile tests to bolster its image as a regional powerhouse. Washington's response to these provocations has been weak: White House press secretary Josh Earnest declared that the missile test was "not a violation of the nuclear agreement" but reassured reporters that "we're still reviewing the launch ... to determine what the appropriate response is." President Obama's Iran policy has occasioned a dramatic change in the regional balance of power, yet he and his administration appear largely unperturbed. To add insult to injury, Washington is withdrawing in a manner that does not command respect. It left Iraq without waiting to build up the Iraqi army adequately. It is withdrawing from Afghanistan without leaving a government strong enough to withstand the pressure of the Taliban. It refrained from attacking Assad when the dictator used chemical weapons on his citizens in flagrant defiance of a red line enunciated by the U.S. president. Washington has ruled out the military option in its negotiations with Iran and now conducts a very low-profile campaign against ISIS with limited success. Overall, the United States projects an image of pathetic fatigue and weakness—an image of which both friends and foes are acutely aware. Whereas the Obama administration's Iran policy has been primarily guided by wishful thinking about the possibility of encouraging moderation in that country, the apprehensions of regional actors with regard to Tehran's hegemonic ambitions have correspondingly multiplied, especially in response to the nuclear deal. While Washington says it welcomes Iranian assurances "to work on regional stability," leaders in Ankara, Cairo, Jerusalem, and Riyadh see Tehran's behavior as almost entirely unaltered from its pre-deal state in any meaningful political sense, with the added potential of its ability to produce nuclear bombs in a short time. The gravest consequence of the U.S. policy of disengagement from the region is the increased probability of nuclear proliferation. Powers contending for regional leadership, such as Egypt, Turkey, and Saudi Arabia, will not stand idly by in the nuclear arena particularly as Washington is no longer seen as a reliable security provider. Riyadh has made it eminently clear that it desires a nuclear infrastructure on par with that of Iran, and Turkey and Egypt are in the process of enhancing their nuclear programs. It will take considerable time for such programs to come to fruition, but the nuclear race is on. The Obama administration's attempts to convince regional powers to rely on a U.S. nuclear umbrella in a bid to prevent nuclear proliferation are likely to fail because of the fecklessness on display. The emergence of a multi-polar nuclear Middle East, which is a plausible consequence of the U.S. nuclear accommodation with Iran, will be a strategic nightmare for the world. The gravest consequence of U.S. disengagement from the region is the increased probability of nuclear proliferation. As noted, the nuclear deal with Iran is not linked to any demand for a change in Tehran's foreign policy or its military build-up. The Islamist regime continues to invest in its missile program and naval capabilities and to pursue its interventionist policies with great vigor, boasting the control of four Arab capitals: Baghdad, Beirut, Damascus and Sanaa (Yemen). The February 2016 parliamentary elections produced an Iranian Majlis scarcely more moderate than its predecessor, and any change in Iranian policies is highly unlikely. An emboldened Tehran, which traditionally acts through proxies rather than direct military conquest, might intensify its campaign to subvert Saudi Arabia, possibly by agitating the population in the country's oil-rich Eastern province where Shiites are a majority. The loss of that province would seriously weaken the Saudi state and might even bring about its disintegration. The visible consequences of the unraveling of statist structures in Iraq, Libya, Syria, and Yemen do not augur well for the desert kingdom. Tehran could use subversion, terrorist attacks, and intimidation of the Persian Gulf states to evict the thinning U.S. presence completely from the gulf. This is a stated goal of the Islamic Republic of Iran, and in the absence of U.S. determination and ability to project force, an Iranian superior power might turn the gulf monarchies into satellites though these states have enjoyed a U.S. security umbrella up to this point. Bahrain, home to the headquarters of the U.S. Fifth Fleet, is particularly vulnerable to Iranian subversion as its majority Shiite population has many grievances against the ruling Sunni monarchy, hence could be readily manipulated by Iran. The satellization of the Caspian basin, where Iran shares the coast with important energy producers such as Azerbaijan and Turkmenistan, is another plausible scenario. This area and the Persian Gulf form an "energy ellipse" containing a large part of the world's energy resources. Tehran wants to link its massive energy resources to key regional projects that transport energy via the South Caucasus to European markets. Iranian activism in the south Caucasus and Central Asia has increased following the lifting of sanctions that accompanied the nuclear deal. 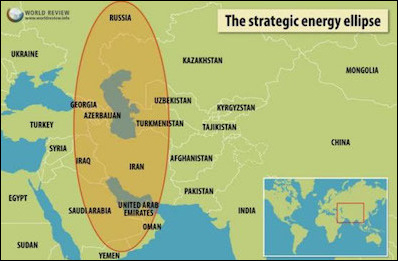 The satellization of the "energy ellipse," if it occurs, would bestow upon Tehran a central role in the world energy market. Azerbaijan and Turkmenistan are very fearful of growing Iranian influence. It is possible that those countries, which adopted a pro-Western foreign policy orientation after the dissolution of the Soviet Union, might either bow to Tehran's wishes or decide to return to the Russian orbit, as Moscow appears to be a much more reliable ally than Washington. The Western loss would be considerable. Russia is fully alive to the potential for a reassertion of its historic role in the region. Though NATO proclaims that the European theater has diminished in strategic importance, Moscow seems to have other thoughts. The Mediterranean region, bordering NATO's southern flank and the Middle East, was the core of all essential dangers to Russia's national interests according to Russian defense minister Sergei Shoigu, and continued fallout from the Arab upheavals of the past five years has only increased the region's importance. Shortly after releasing the previous statement, Shoigu announced the decision to establish a navy department task force in the Mediterranean "on a permanent basis." 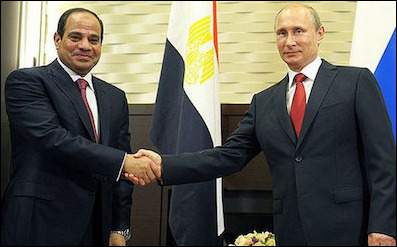 Russian president Vladimir Putin (right) meets with Egyptian president Abdel Fattah Sisi. Russia understands the potential for a reassertion of its role in the Middle East in the wake of a U.S. retreat. In addition to intervening in Syria, the Russians are also engaging with Cairo: selling weapons, negotiating port rights, and supplying nuclear reactors. The Russian naval facility in Tartus, on the Syrian littoral (leased since 1971), is a vital base for enhanced Russian naval presence in the eastern Mediterranean, and Moscow has gradually improved its fleet size and stepped up patrols in the area. Its greater military footprint in the eastern Mediterranean is intended to project in-creased power into the Middle East. Putin has taken the major step of intervening militarily in Syria to assure the survival of the Assad regime and, with it, continued access to the Russian naval base. In addition, as a major player in the global energy market, he also wants to protect energy prospects that depend on Assad's survival. Moscow has already signed exploration contracts with Damascus with regard to recent gas discoveries in the Mediterranean basin. The preservation of the Assad regime is also vital for Tehran because Damascus is the corridor to Hezbollah, its Shiite proxy in Lebanon. Syria has been an ally of Iran since the establishment of the Islamic Republic in 1979—one of the longest alliances in the Middle East. Moreover, Syria could serve as a launching pad for Iranian destabilization of Jordan, a longstanding U.S. ally. Moscow's efforts on Assad's behalf thus directly serve the interests of the Iranian regime. If successful, those efforts will further Tehran's influence in the region. The confluence of Iranian-Russian interests is also visible outside Syria. Putin is certainly not averse to the Iranian goal of pushing Washington out of the Persian Gulf. Russia is also a clear beneficiary of the nuclear deal, which frees it from international constraints on exporting arms to Tehran. A further outcome of the U.S. withdrawal may well be Iran joining Russia in supporting Kurdish political ambitions in order to weaken Turkey, its main rival for regional leadership. Kurdish aspirations have long been a thorn in Turkey's side. While Tehran and Ankara are supporting opposing sides in the Syrian civil war, the Kurds are busy carving out autonomous regions from the moribund state. Kurdish national dreams might, therefore, actually benefit from the power vacuum created by the disruption of Arab statist structures and the U.S. exit from the region. The emergence of an independent Kurdish entity in northern Iraq seems more probable nowadays with Washington seemingly taking no clear position on such a contingency. Another consequence of the U.S. exit can be seen in changes in Egypt. Moscow, for one, has been well served by Washington's reluctance to support the regime of Abdel Fattah Sisi, who came to power following a military coup against President Muhammad Morsi of the Muslim Brotherhood. The Russians are selling the Egyptians weapons, negotiating port rights in Alexandria, and supplying them with nuclear reactors. In Iraq, too, there are harbingers of a Russian presence in coordination with Iran as U.S. influence in that state continues to wane. Iraq signed an arms deal with Russia in October 2012, and a joint intelligence center was set up in Baghdad in October 2015. Baghdad is also seeking Russian military support in its anti-terrorist campaign. Moscow's and Washington's different approaches to the region tell the regional protagonists, "America is feckless; Russia and Iran are strong." In the meantime, the rise of a more aggressive Iran—a direct consequence of the U.S. retreat—may bring about greater tacit cooperation between Egypt, Jordan, Saudi Arabia, and Israel. A big question is whether Ankara would join this anti-Iranian alignment. The Turks and the Persians have long been rivals who have nonetheless displayed great caution toward each other in the more recent past. Moreover, Turkey under Erdoğan has been at loggerheads with both Egypt and Israel while at the same time becoming increasingly dependent upon energy from Iran. Regardless of Ankara's behavior, a reduced U.S. commitment in the region is also likely to influence the destiny of the Hashemite Kingdom of Jordan, a long-standing pro-Western country and a beneficiary of U.S. support. Amman could have more and more difficulty insulating itself from what is happening just beyond its borders—the mayhem in Syria and the growing Iranian role in Iraq. Iran or ISIS, given their greater freedom of action following the U.S. retrenchment, may also increase attempts to destabilize Jordan. The rise of Iran and the potential for nuclear proliferation are detrimental to Israel's national security. However, for Israel, the stability of Jordan as a buffer state is critical. Their joint border is the longest and closest to the Jewish state's heartland, and the Hashemite dynasty has been both an informal and a formal ally of Jerusalem for decades. While the dissolution of neighboring Arab states has reduced the threat of large-scale conventional military attacks against Israel (with the additional positive effect of reducing somewhat its dependence on U.S. weaponry), Jerusalem cannot be happy with the turn of events. The growing Iranian threat, and the greater appeal of radical Islam in the region, facilitates cooperation between Israel and "moderate" Sunni states such as Egypt, Saudi Arabia, and Jordan, but they are the proverbial weak reeds. Sunni forces are, however, losing in Syria, Yemen, and Iraq. The rise of Iran and the consequent change in the regional balance of power, together with the growing potential for nuclear proliferation, are detrimental to Israel's national security. Jerusalem is being pushed into a preemptive mode to minimize the repercussions of Obama's nuclear deal and mitigate its effect on the regional strategic equation, but it may well choose to wait until the president is out of office to take significant action. 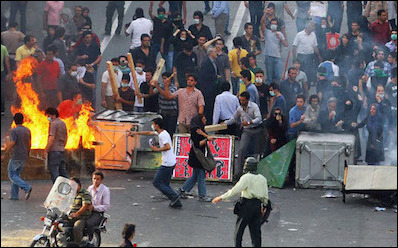 In President Obama's rush to engage foes such as Iran, he has turned his back, for example, on the Iranian people who protested against the stolen June 2009 presidential elections. The disengagement of the United States from the Middle East may be the final chapter in its longstanding support for liberty and democratic movements around the world. Nonetheless, the U.S. retreat from the Middle East, and the manner of that retreat, weakens Israel's deterrence. The perception that Washington will come to Israel's aid in case of need has been a longstanding and important component of Jerusalem's ability to project a deterrent threat. The new perception of the U.S. administration as a vacillating ally damages that deterrence. In addition, Washington's attempt to compensate its Arab allies for the Iranian nuclear deal by providing them with the latest state-of-the-art weapons erodes Israel's qualitative edge. As a result, the U.S. exit from the Middle East ironically increases Israel's leeway to do as it sees fit. It is left with less of an obligation to weigh the consequences of its own actions on U.S. interests and personnel in the region. Moreover, the logic of "offshore balancing," whereby one country uses favored regional powers to check the rise of potential hostile powers, if pursued post-Obama, ought to see an increase in Washington's dependence on Jerusalem as the latter is the strongest and friendliest military power in a highly volatile region. Lastly, Washington's disengagement from the Middle East appears to be the final chapter in its longstanding support for liberty and democratic movements around the world. It undermines the relatively small and weak pro-democratic forces in the Arab world, which need greater U.S. involvement and support for their causes. The option of regime change in Tehran has faded away as challengers to the mullahs see little hope of getting substantial assistance from Washington. Similarly, in Turkey, where a struggle is taking place over the identity and soul of the nation, pro-democratic, pro-Western forces are discouraged by Washington's regional policies. U.S. weakness in the Middle East will inevitably have ripple effects in other parts of the globe. Its credibility is now subject to question, and allies elsewhere may determine that it would be wise to hedge their bets and look elsewhere for support. The decision to exit the Middle East, while leaving intact a large part of the Iranian nuclear infrastructure, has created incentives for nuclear proliferation in other regions of the world. Credible U.S. guarantees backed by military presence were once an effective way of encouraging states to make the strategic calculation in favor of nuclear restraint. Such credibility has been drastically eroded. Parts of Europe are within range of Iranian missiles, an arms program not even addressed in the U.S.-brokered deal. Washington's reluctance to confront Tehran on the nuclear issue sends the message that new nuclear aspirants need not fear direct U.S. intervention, despite the administration's stated commitments to counter proliferation. In addition, states that are ready to sell sensitive technologies are now less deterred by Washington. One can already see increased cooperation between North Korea and Iran. The difficulties the International Atomic Energy Agency (IAEA) has had in inspecting Tehran's nuclear facilities, and the ridiculously ineffective verification clauses accepted by the Obama administration in the JCPOA, do not augur well for the future of the Non-Proliferation Treaty (NPT). While the NPT is not a panacea for preventing global nuclear proliferation, it was a useful tool insofar as it restrained modest nuclear aspirations. Russian assertiveness, in parallel with U.S. feebleness, has also increased the threat perception in countries such as Poland, which might decide that its security would be enhanced by nuclear weapons. A similar rationale could lead Australia, facing increased Chinese clout, to consider a nuclear program. Japan, South Korea, and Taiwan share similar apprehensions about U.S. determination and power and might also conclude that nuclear weapons have become a necessity. The U.S. exit from the Middle East further exacerbates European weakness. The European Union—lacking military force, dis-playing questionable political will, and becoming an aging political entity—is hardly a strategic player. It now faces a huge demographic challenge as migrants from the Middle East and North Africa pour into its borders. Capitalizing on EU weakness and U.S. indifference, Turkey is pushing immigrants into Europe even while it is being paid by the EU not to do so. Europe's record on absorbing immigrants from Muslim countries is already problematic, and the continent will need seriously to address this new problem if it is to maintain its identity. The recent terror attacks in Brussels and Paris vividly demonstrate these dual concerns: Jihadists, posing as refugees, can murder scores of European citizens and manage to evade domestic security services by hiding in the midst of their Muslim compatriots, hosted by these very same European countries. Meanwhile, parts of Europe are within range of Iranian missiles, an arms program that was not even addressed by the U.S.-brokered JCPOA. Europe may, therefore, be in even greater danger from events in the Middle East that are partly the result of the U.S. abandonment of the region. The advent of a nuclear Iran will likely also have a negative effect on the stability of the Indian sub-continent. Tehran's neighbors will inevitably have to adjust their nuclear posture in response to a new nuclear player. Sunni Islamabad may be eyeing Shiite Iran with even greater suspicion while any change in Pakistan's nuclear posture is apt to prompt a response by India, potentially increasing tensions between them. Nuclear arsenals at the disposal of the two states have not induced greater caution on the Pakistani side. Furthermore, upheaval in the Persian Gulf, threatened as it is by Tehran's aspirations, could disrupt oil supplies to both nations and harm their economies. The Indian sub-continent—India, Bangladesh, Nepal, and Pakistan—which benefits from remittances from a large diaspora in the Gulf region, might be particularly vulnerable. Washington's behavior in the Middle East is also increasing its difficulties in the Muslim world at large. Obama started his presidency by visiting Turkey and Egypt in a clear effort to improve U.S. relations with Muslim-majority states. Notwithstanding that effort, the president's subsequent policies have resulted in a widespread perception that his administration has sided with the Shiites rather than with the huge Sunni majority in the Muslim world. The nuclear deal with Iran, a Shiite power, was opposed by most Sunni states in the Middle East. Moreover, the limited U.S. military effort against ISIS— a barbaric, radical organization, albeit Sunni—has helped consolidate the Assad regime in Syria, a key component of the perceived Shiite axis. While the Sunni-Shiite religious divide does not necessarily resonate the same way across all Muslim realms, U.S. policy undoubtedly leaves important Sunni states such as Indonesia and Malaysia uneasy. In more general terms, a weaker United States strengthens anti-American and anti-democratic forces around the globe. Apprehensions in Central Asia have already been mentioned, and Russia under Putin has become more assertive in Eastern Europe and might try to exert greater influence in the Caucasus and Central Asia. But it is with regard to China that the greatest potential for a major realignment exists due largely to perceived U.S. exhaustion. Beijing may become even less cooperative in the future, primarily in its immediate region. North Korea is, after all, a Chinese satellite, and Pyongyang could adopt a more destabilizing posture toward South Korea. China could become more aggressive in the sale of missile and nuclear advanced technologies. Beijing's creation of artificial islands on disputed South China Sea reefs—the actual dredging and pumping of sand, ongoing since 2014—represents its latest attempt to extend Chinese territory and exert pressure over the five other countries that claim parts of the sea. So far, Washington has displayed great reluctance to confront Beijing. U.S. allies in Asia could decide that their interests are served better by a realignment of relationships. Taking into consideration the rise of China, they might calculate using traditional balance of power thinking and opt to be on the stronger side. The image now projected by the United States is a country in decline that can no longer be assumed to be a reliable ally. China may benefit by comparison. Washington is retrenching; it is projecting weakness and eliciting doubts about its value as an ally. While the United States under a different leadership has the potential to snap back, this could take time. Building military assets is a lengthy process, particularly when it comes to training qualified military forces. Overcoming mistrust is perhaps more difficult. Certain strategic losses, such as foreign policy reorientation by former allies, are not easily reversible. Washington is retrenching, projecting weakness, and eliciting doubts about its value as an ally. U.S. allies in the Middle East believe Washington needs a different lens through which to view international affairs. It needs a clear conceptual framework to identify friends and foes. This is a basic mechanism for any military activity and has to be deployed from within the politico-strategic sphere. As Samuel Johnson observed, despite the twilight, there is still light and darkness. Strategic clarity is vital, even if—or particularly if—situations are obscure. style disengagement has produced harmful outcomes for the United States and its allies. While the Middle East seems to have become gradually less important in the international arena, it is still very relevant with respect to several global challenges: Islamic radicalism, nuclear proliferation, and energy security. For the time being, there is no alternative to a responsible and well-calibrated U.S. role in world affairs. A strong and selective U.S. position is also important for spreading the values for which it stands—democracy and the free market. Abdicating such a role is simply irresponsible. Efraim Inbar, director of the Begin-Sadat Center for Strategic Studies, is professor emeritus at Bar-Ilan University and a fellow at the Middle East Forum. See Jeffrey Goldberg, "The Obama Doctrine," The Atlantic, Apr. 2016; Daniel Drezner, "Does Obama Have a Grand Strategy?" Foreign Affairs, July/Aug. 2011; Colin Dueck, The Obama Doctrine: American Grand Strategy Today (Oxford: Oxford University Press, 2015); Steven David, "Obama: The Reluctant Realist," in Efraim Inbar and Jonathan Rynhold, eds., US Foreign Policy and Global Standing in the 21st Century. Realities and Perceptions (London: Routledge, 2016). Such an approach is commonly known as "offshore balancing." See, for example, Christopher Lane, "From Preponderance to Offshore Balancing: The United States' Future Grand Strategy," International Security, Summer1997, pp. 86-124; John Mearsheimer, "Imperial by Design," The National Interest, Jan./Feb. 2011, pp. 16-34; Stephen Walt, Taming US Power. The Global Response to US Primacy (New York: Norton 2006); Barry Posen, Restraint. A New Foundation for US Grand Strategy (Ithaca: Cornell University Press, 2014). For a criticism of the offshore balancing strategy, see Hal Brands, "Fools Rush Out? The Flawed Logic of Offshore Balancing," Washington Quarterly, Summer 2015, pp. 7-28. Richard Wike, Bruce Stokes, and Jacob Poushter, "America's Global Image," Pew Research Center, Washington, D.C., June 23, 2015; Bruce Stokes, "Which countries don't like America and which do," Pew, July 15, 2014. See, for example, Posen, Restraint, pp. 87-130; Efraim Karsh, The Tail Wags the Dog: International Politics and the Middle East (London: Bloomsbury, 2015), chaps. 3-4. David Shambaugh, "Assessing the US 'Pivot' to Asia," Strategic Studies Quarterly, Summer 2013, pp. 10-9. The Hill (Washington, D.C.), Aug. 16, 2015. For a critique of Obama's foreign policy toward the Middle East, see Efraim Karsh, "Obama and the Middle East. Illusions and Delusions," in Inbar and Rynhold, US Foreign Policy and Global Standing in the 21st Century, pp. 181-97. For the Obama administration's approach to terror, see Jessica Stern, "Obama and Terrorism. Like It or Not, the War Goes On," Foreign Affairs, Sept./Oct. 2015, pp. 62-71. For an assessment of the U.S. campaign against ISIS, see Yaroslav Trofimov, "Regional Discord Fuels Islamic State's Rise in Mideast," The Wall Street Journal, Oct. 17-18, 2015. The New York Times, Nov. 2, 2015. The Washington Post, Oct. 2, 2015. Yaakov Amidror, Perfect Storm: The Implications of Middle East Chaos, BESA Memorandum, no.8 (Ramat Gan: Begin-Sadat Center for Strategic Studies, Bar-Ilan University, July 2015), p. 25. PBS News Hour, July 17, 2015; MSNBC, Apr. 21, 2016. "Emerging Nuclear Energy Countries," World Nuclear Organization, London, Feb. 2016. Middle East Eye (London), Mar. 10, 2015. Patrick Clawson, "Third Time the Charm for Reform in Iran?" PolicyWatch 2578, Mar. 4, 2016. The Fars News Agency (Tehran), May 16, 2015. Ilan Berman, "Iran's Eurasian Adventure. Tehran Builds Its OPEC with Bombs," Foreign Affairs, Feb. 24, 2016. Thomas R. Fedyszyn, "The Russian Navy 'Rebalances' to the Mediterranean," U.S. Naval Institute, Dec. 2013. See, for example, Jiri and Leni Valenta, "Why Putin Wants Syria," Middle East Quarterly, Spring 2016. RT TV (Moscow), Oct. 7, 2015. Colin Cahl and March Lynch, "U.S. Strategy after the Arab Uprisings: Toward Progressive Engagement," Washington Quarterly, Spring 2013, p. 52. Brands, "Fools Rush Out?" pp. 18-9. Paul K. Kerr, Steven A. Hildreth, and Mary Beth D. Nikitin, "Iran-North Korea-Syria Ballistic Missile and Nuclear Coopertion," Congressional Research Service, Washington, D.C., Feb. 26, 2016; see also, Emily B. Landau and Alon Levkowitz, "Will Iran Continue Its Nuclear Program Abroad?" The National Interest, Feb. 19, 2016. Mark Fitzpatrick, Asia's Latent Nuclear Powers. Japan, South Korea and Taiwan (New York: Routledge for IISS, 2016). The Jerusalem Post, Aug. 6, 2015. Aaron L Friedberg, "The Debate Over US China Strategy," Survival, June-July 2015, pp. 89-110. See, for example, The Huffington Post (New York), Oct. 25, 2013. Related Topics: Iran, Russia/Soviet Union, US policy | Efraim Inbar | Summer 2016 MEQ receive the latest by email: subscribe to the free mef mailing list This text may be reposted or forwarded so long as it is presented as an integral whole with complete and accurate information provided about its author, date, place of publication, and original URL.